What are the immediate and long-term effects of bullying? Will bullying make your child's social anxiety worse? Bullying has become an increasingly common occurrence in schools and playgrounds. Whether cyberbullying, harassment at school, or physical violence on the school bus, many children live in fear. If you have a socially anxious child, bullying may be even more prevalent. About one in five children will be bullied from elementary through high school. Bullies pick on children who have trouble defending themselves. Sometimes victims of bullying may even become bullies themselves. Most children who are bullied do not tell anyone. In particular, older boys are less likely to report bullying. Pay attention to changes in your child's behavior and emotions so that you can pick up on bullying that is being hidden. The long-term effects of bullying on a child can include problems with self-esteem and anxiety. It is important to intervene early if you suspect that bullying is taking place. Children who have few friends are unable to defend themselves and those with low feelings of self-worth may not stand up for themselves. Some studies have been conducted to investigate the effects of bullying using rodents such as mice or rats. Though this might sound strange, rodents are believed to have similar stress responses as humans, so this type of research is meaningful. In one study, mice were exposed to a "mouse bully" over the course of 10 days and changes in the brain of the stressed mice were examined. Results indicated that the hormone vasopressin was activated, which led to an increase in brain receptors sensitive to social stimuli. After the stress, the bullied mice stayed away from all other mice, even friendly ones. This shows that humans may have the same reaction: chronic bullying may elevate stress hormones that could cause a reduction in social behavior. In a second study, rats were subjected to social stress but were either housed with another rat or alone before and after the stress. Findings showed that the stressed rats who had been paired with a friend before and after were more resilient and better able to recover. 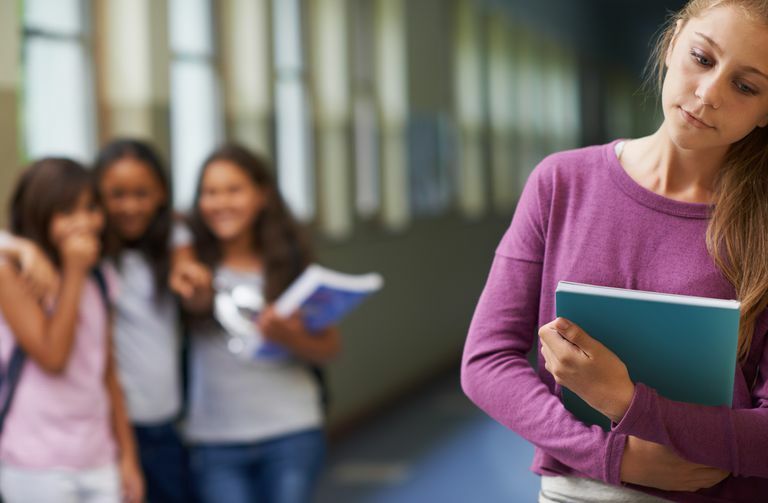 This research suggests that having even just one friend may have a protective effect for your child to withstand bullying. While it may be tempting to take a bullying situation with your child into your own hands, there are steps you can take to help de-escalate the situation and protect your child. Be open to discussing the bullying and don't criticize how your child has handled the situation so far. Inform your child's teacher and principal about the bullying. Make sure that your child has an adult at school that he can tell if he is being bullied. Encourage your child to develop friendships at school. Identify safe places that she can go outside of school if she feels threatened, such as a block parent's home. If there is not already a bullying prevention program in place at your child's school you may wish to make the suggestion. If you suspect that your child is being bullied, take the situation seriously. Children are embarrassed and ashamed to admit to being bullied, so your support is critical. Stay calm, talk to the school, and give your child skills to cope with the situation. Buwalda B, Stubbendorff C, Zickert N, Koolhaas JM. Adolescent social stress does not necessarily lead to a compromised adaptive capacity during adulthood: A study on the consequences of social stress in rats. Neuroscience. 2013 Sep 26;249:258-70. Litvin Y, Murakami G, Pfaff DW. Effects of chronic social defeat on behavioral and neural correlates of sociality: Vasopressin, oxytocin, and the vasopressinergic V1b receptor. Physiology & Behavior. 2011 June;103(3-4):393-403. Ranta K, Kaltiala-Heino R, Fröjd S, Marttunen M. Peer victimization and social phobia: A follow-up study among adolescents. Social Psychiatry and Psychiatric Epidemiology. 2013 April; 48(4):533-544.